Energy and the Environment-A Coastal Perspective - What are the efficiencies of the devices? In Matt Folley and al.’s[i] study on the OWSC, the efficiency of the device was based on its capture factor. 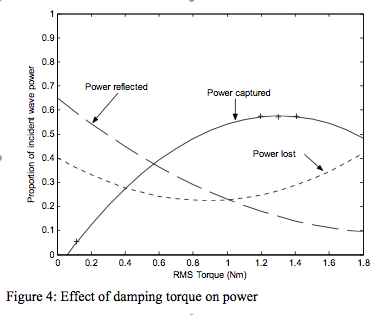 The maximum capture factor is determined by plotting the root mean square (RMS) of the braking torque against the capture factor. The optimum torque occurs when the sum of the reflected and radiated wave power and the power lost to viscosity and turbulence is minimal. In the North Atlantic wave climate, Matt Folley and his peersii find that the average capture factor is 0.46.